Alloa Athletic chairman Mike Mulraney expects "finished article" Jim Goodwin to leave for a bigger club in the not too distant future. Alloa Athletic climb off the bottom of the Championship after Jack Hamilton's late strike at Morton makes it three consecutive wins for the Wasps. All the arrivals and departures during January in the Scottish Championship. BBC Scotland gives a rundown of the arrivals and departures during summer 2018 in the Scottish Championship. BBC pundit and former St Mirren striker Steven Thompson examines the reasons why Alan Stubbs was sacked and where the club go from here. BBC Scotland gives a rundown of the arrivals and departures during January 2018 in Scottish League One. 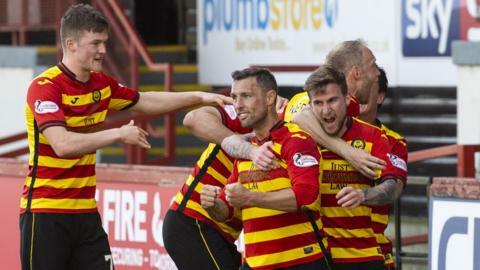 BBC Scotland gives a rundown of the arrivals and departures during summer 2017 in Scottish League One. BBC Scotland gives a rundown of the arrivals and departures during summer 2016 in Scottish League One. Rob Maclean highlights the value of Tommy Wright, Mark O'Hara, Jamie MacDonald and Liam Boyce, and the buzz around Alloa.